Given how much I have enjoyed the Skechers GoRun Strada (REVIEW) and GoRun 4 2016 (REVIEW), I have been eyeing the Skechers GoMeb series for quite some time. I love racing flats and have spent more of my running career in them than any other type of running shoe. The GoMeb series seemed like my kind of shoe. A marathon racer with just enough cushion for long miles with a plate for additional responsiveness. AKA a fast, light but protective shoe. Recently, Skechers Performance Division contacted me and was nice enough to send me a pair of the new Skechers GoMeb Speed 3 2016. I did not know what to expect but this shoe has quickly become one of if not my favorite racing flat of all time. On par with the my love for the Mizuno Wave Universe 4 but for different reasons. Being an individual who also frequents Ebay looking for cheap and rare shoe deals (I am a poor graduate student with strong Jewish heritage... I'm always looking for good deals), I happened upon a pair of original GoMeb Speed 3 for cheap and made a purchase to have something to compare to. I have not run or tried the GoMeb Speed 1 or 2, so it was nice to have something to compare to. The verdict? 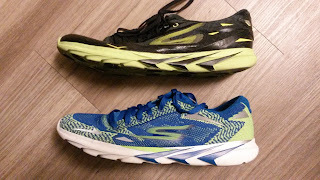 I love both of these shoes for different reasons and can say that I am definitely on the Skechers Performance bandwagon.. The GoMeb Speed 3 2016 and Speed 3 are within the same line but are drastically different. How so? Read on to find out. The Skechers GoMeb Speed 3 2016 and Speed 3 both are listed at having a 4mm drop. Both feel in the 4-7mm drop range with the Speed 3 2016 feeling lower than the Speed 3. The Speed 3 is definitely more of a marathon racer/lightweight trainer as it has more sole material (which you can clearly see in the photos above and below) and a more forgiving ride. It feels great at all paces, even recovery runs (which have a tendency to become uptempo workouts....). The Speed 3 2016 is more of a 10k to marathon racer with the comparatively firmer ride. It excels at all paces except recovery runs as the true nature does not come out running slow. Running fast this shoe will propel you forward thanks to the awesome Dupont Delrin plate that begins in the heel and extends through the midfoot. Both the Speed 3 2016 and Speed 3 have this plate and it definitely adds to the responsiveness of these shoes. It reminds me of the extended torsion system of the Adidas Adios and Takumi series (more on this later). 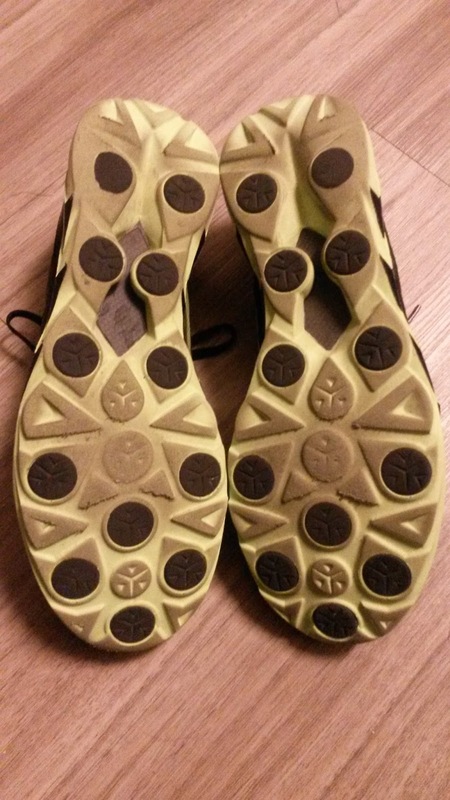 I look forward to more racing flats having this feature that previously only track spikes had. Combined with the firmer 5Gen midsole of the Speed 3 2016, the ride becomes extremely fast when you pick up the pace. Both shoes have extremely smooth rides no matter where you land. The curved, anatomical heel makes landing there smooth while the responsive forefoot/midfoot areas combined with the plate make the shoes very responsive. The toe spring is relatively low in both shoes and they have decently flexible forefoot areas. This gives both shoes fast and smooth toe-offs. I do feel mild medial stability elements in the posterior medial heel, especially in the Speed 3 2016. This is mild at most and feels great. I do not know if that was an intended feature or if that is coming from the additional TPU shank, but it definitely helps during longer workouts. Again this is a very minor feature that I would not have noticed if I did not have such sensitive feet. Definitely helps toward the end of longer workouts and may be on of the reasons I have been able to use the Speed 3 2016 for 10 mile tempo runs and races and the Speed 3 for 20 mile long runs. Most people will not notice this, so if you have a fear of stability elements don't worry. Durability wise both shoes have some mild wear in the central forefoot and posterior lateral heel. After 62 miles in the Speed 3 2016 and 96 in the Speed 3, the rides have only gotten smoother and faster as they have broken in (they were both great straight out of the box and do not require any break in time). 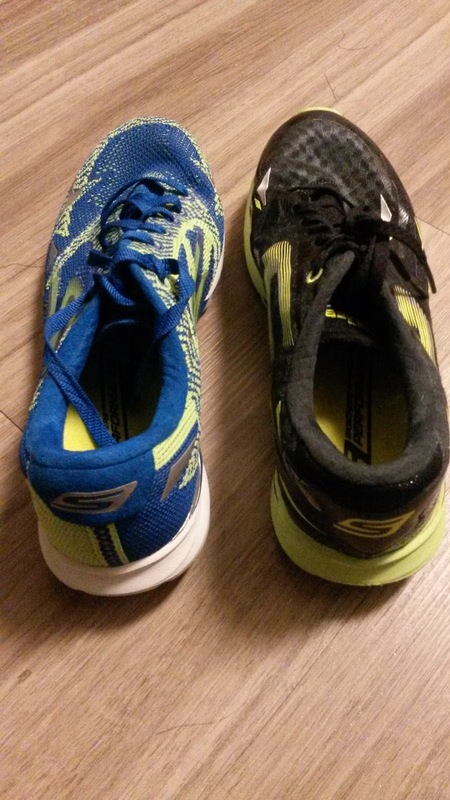 The wear is at a normal level and is fantastic compared to previous Skechers Performance shoes I have run in. Definitely expect to get at least 250-300 miles out of each pair if not more (I tend to retire my shoes just a bit early as a preventative measure against injuries). The extra durable nubs on the sole of both have added to the durability and traction as I have not had any slippage issues even with the recent rain we have had in Southern California. The Skechers GoMeb Speed 3 2016 and Speed 3 have two very distinct but well fitting uppers. The Speed 3 has a traditional mesh upper while the Speed 3 2016 has the new GoKnit upper similar to the GoRun 4 2016. Both shoes have similar good fits in the heel. I use a lace locking technique all my shoes and have never had any slippage issues with either shoe. Both shoes have heel counters but the counter in the Speed 3 is much more noticeable. The Speed 3 2016 does have one but it is flexible and most of the time I do not notice it. In fact, I tend to completely forget about the entire upper of the Speed 3 2016 because it completely disappears off the foot when I am running. The GoKnit upper is flexible, breathable, secure and very comfortable. It molds to your foot while still holding it onto the shoe and giving it a racing flat feel. 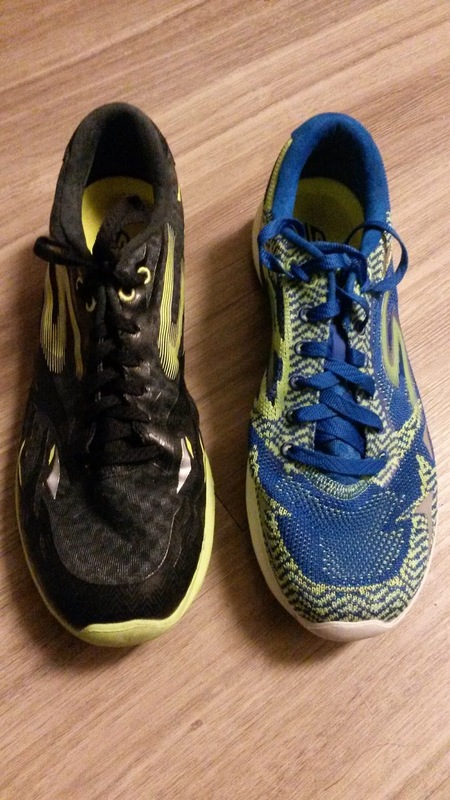 Like the GoRun 4 2016, this upper does make the Skechers GoMeb Speed 3 2016 feel like it fits slightly long (despite measuring the same length as the Speed 3) when you are standing in the shoe. During running I do not notice this as much and have found that a slightly thicker pair of socks fixes this issue (I tend to wear very thin socks from Feetures). The Speed 3 however fits very true to size if not a tiny bit short, so again this issue has been solved with wearing thinner socks. Both shoes have decent room in the toebox without feeling sloppy. These are not Altra ride, but they are comfortable considering they are racing flats. The Speed 3 feels like it naturally has more width even with the traditional mesh upper, but the Speed 3 2016 molds to your individual foot to a greater degree. I have not had any hotspots in either despite long and fast runs in both shoes (and a race in the Speed 3 2016). I have not had any upper durability issues with the Speed 3 2016 or Speed 3. There are no seams loose, no tears and the upper in the Speed 3 2016 fits to my foot better each time I wear it. The GoKnit upper also makes the shoe much more breathable and has done well during warmer weather runs (especially here in Southern California). Overall great uppers and I am excited where Skechers Performance Division takes this technology as they have already done a much better job than both Nike (Flyknit) or Adidas (Primeknit) at a lower cost. The Skechers GoMeb 3 2016 weighs in a 7.3 ounces and the GoMeb 3 weighs 7.7 ounces in a size 10 per my scale. The weight difference is noticeable and contributes to the difference in feel. As I mentioned previously, both shoes are very responsive. The GoMeb Speed 3 is more cushioned/protective while the Speed 3 2016 is firmer and more responsive. 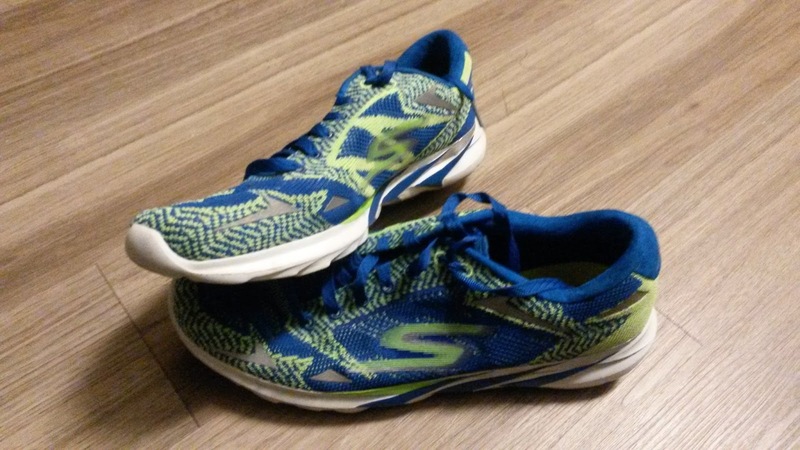 I recently used the Skechers GoMeb Speed 3 2016 at the Brea 8k. This is a shorter race than I would not normally think to use a 7.3 ounce shoe and the previous two shoes I have used during my times here have been 1-2 ounces lighter than the Speed 3 2016 (Brooks T7 Racer and Mizuno Wave Ekiden 9). Despite all of this, I was only 2 seconds slower than when I raced there 2 years ago (last year was especially slow) early in DPT school before exams, stress, tutoring, clinical rotations, late night studies and more slowed me down. This is the heaviest shoe I have raced in since the Brooks Racer ST 5 (HM PR) and it disappeared off my foot. At no point did I feel like the shoe was weighing me down. In fact I felt like I was being propelled forward naturally and smoothly. 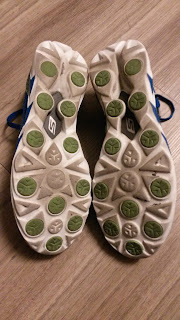 I have been using this shoe for all my workouts recently including fartleks, 4-10 mile tempos, hill repeats and more. It has just enough shoe there for any type of workout and I plan for this to be my racing flat of choice for the foreseeable future. The GoMeb Speed 3 2016 is a do-it-all racing flat that I would even be comfortable using as a 5k racer and will definitely be on my feet when I race my first marathon. The GoMeb Speed 3 on the other hand is my favorite long run and long workout shoe. I have used this shoe during long tempo runs, long impromptu fartlek workouts that were supposed to be longer recovery runs and most importantly 2 separate 20 mile long runs. It performed amazing especially on those long runs and I walked away no more beat up than normal. The extra cushioning allowed for me to pick up the pace during long runs and still feel protected for those all those miles. This shoe is nowhere close to being a Hoka shoe and definitely fits into the lightweight trainer/marathon racer category similar to the Adios and Kinvara series. I do not think I would race anything shorter than a half marathon in this shoe (and would definitely prefer the Speed 3 2016 for the HM) but for 50k or more this would be my racing flat of choice. I can completely understand why and how Skechers Performance and Meb Keflezighi designed this shoe for the marathon distance. I am very happy with the biomechanical designs of both shoes. The curved heel is shaped just like the calcaneal bone which is very rare to see in a racing flat. This does not slow down the ride at all but does contribute to how smooth both the GoMeb Speed 3 and Speed 3 2016 feel at any speed. The Dupont Delrin plate is placed in a great location in the heel/midfoot to mimic and work with the plantar fascia of the foot. The whole point of the plantar fascia is to provide stability, elasticity and transfer force to help aide the different rockers of the foot. I do wish the plate extended a bit farther into the forefoot for added responsiveness but that might compromise the already smooth, responsive and flexible ride up front. I am very happy as a Doctor of Physical Therapy (Student... soon. to graduate though!!) the care, effort and precision that Skechers Performance Division has been putting into their performance line that I have tested so far! Extremely excited to see them to work with the human body rather than for or against it like many other companies continue to do even in the 21st century. 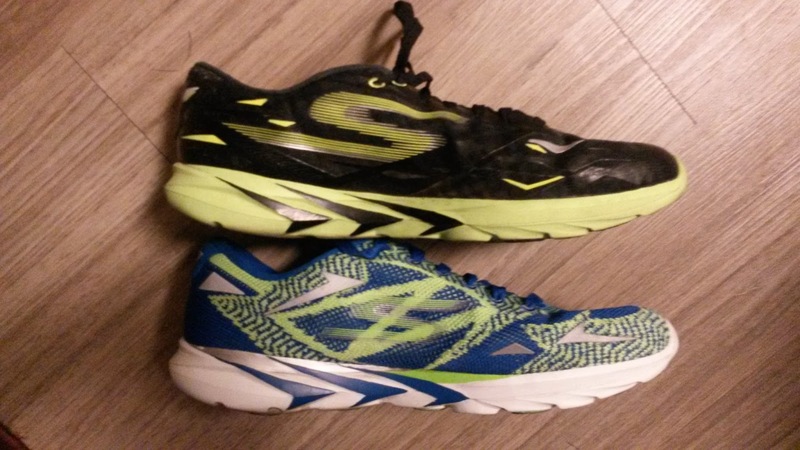 The Skechers GoMeb Speed 3 2016 and Speed 3 are both great shoes. The upgrade to the Speed 3 2016 has created one of my favorite racing flats thanks to the lighter weight, extremely responsive ride and pace versatility. I am even willing to say it is one of my favorite racing flats of all time, on par with how much I enjoyed the Mizuno Wave Universe 4 (which I would never use for anything over 10k but the sub 4oz weight and responsiveness was awesome). Despite the relatively heavier weight, I would not hesitate to use this shoe for 5k-marathon. The GoKnit upper provides an amazing custom but secure fit that disappears off the foot and the durability has been very good, especially for a Skechers Performance shoe (I know they're getting better)! 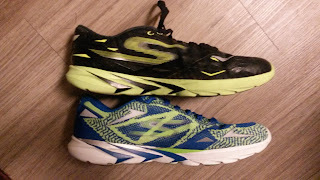 My pair of Skechers GoMeb Speed 3 2016 were provided free of charge from Skechers Performance Division in exchange for a review. This is no way affected my review and all opinions are my own. 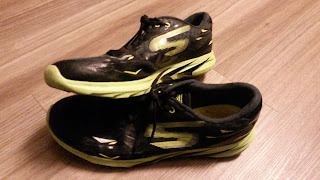 My pair of Skechers GOMeb Speed 3 were purchased for $35 on Ebay brand new. I put at least 75 miles on every pair of shoes before I review them (except racing flats which I put on at least 25 miles). Currently I have 61 miles on my pair of GoMeb Speed 3 2016 and 96 miles on my pair of GoMeb Speed 3.